Installing granite countertop in your kitchen takes alot of money to invest in your kitchen and indeed everyone wants to cut down the total cost. So the best step you can take is Install the countertop yourself as installing charges are also very high ($60-$89 per square foot). 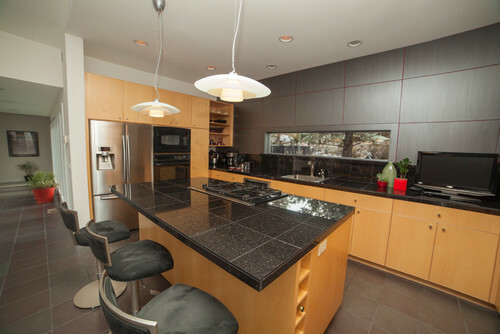 We will help you out to know each step in "How To Install A Granite Countertop?" yourself. Take Precise measurements of the cabinets using an instrumental inch tape, always take little more than the actual measurment. If you will take less measurment than the actual measurment then you will have to make joints and the grout will be visibe which will look odd. Lay a ¾” plywood on top of the cabinets to support the granite. Always add 1/2" while measuring the granite slab for the overhangs for one side. Attach the plywood to the frame using screws and make sure that the plywood does not overhang to the outside of frame as the plywood will be clearly visible later. Also make sure that you tighten the screws properly using a screw driver because if they will be loose than your countertop will also shake. Your walls may not have perfect edge so use a kraft paper or a stiffer material to make a template of the actual measurement. A template makes job easy as it is easy to move around. Scibe the slab if needed and using a circular saw which has a dry cut segmented diamond blade cut the slab carefully. Put the granite slab on the sink counter and trace the exact dimensions of the sink counter. Then remove the slab and cut the dimensions using a jigsaw very carefully. Cover the sink to protect it until you join the granite seams. Use a 1-¼” screws to adjust the height of the slab from the underneath to raise and lower the countertop. Lift the granite carefully and put half dollar dollops of silicone around the cabinets and place a bead of caulk around the sink rim. Similarly apply a second bead on top of sink rim so that the gap between the sink and the countertop, till it becomes waterproof. Put the slab back safely after applying the bead and don't use silicone caulk as after sometime it stains the slab, use acrylic caulk. Apply dollop of polyester based resin and add a small amount of color to match the color of the the granite. Using a putty knife mix the mixture and mix still it matches matches the color of the granite. Add the hardener and mix only on small area as you have only five minutes to apply. After it has dried about 30 minutes, smooth it out with a seam stone. Put the slab back quicly and using firm pressure slowly settle the slab. Now that your installation process is complete it's time to seal the counertop using a sealer to protect it from stains and further wearing out. Use a sealer specifically used for sealing granite countertops and apply it on the countertop and using a clean soft cloth spread it gently throughout. Cut ½”or ¾” plywood to the exact size of the countertop. Using a screwdriver and an electric drill secure the plywood to the cabinet frames. On a cement backer board mark cut the lines and use a skill saw that has an abrasive blade attached to cut the pieces of backer board to fit the plywood on the top. Start laying the tiles from one place and spread it over the whole place as close as possible and make sure that the grout you fill is of equal width across the countertop so that pattern looks consistent and gives the look of a slab. Use the wet saw to cut the tiles from wherever you find the need to cut. Making an angle of 45 degrees using your trowel spread the thinset on your backer board. After this mix a batch of thinset mortar and peanut butter and let it set for several minutes after stirring. Now spread a more thick layer of thinset on top of backer wood. Using spacers between the tiles will help you to get a consistent width of the grout and place your tiles on the thinset and shake the slightly pressing them little downwards so as to set the tiles in place. After the thinset has dried use a grout of the same color as of the granite so that the grout is visible less and gives a feel that no grout in applied between the tiles. Choose a skirt that matches your granite tile countertop or a wood skirt that blends with your countertop. The skirt covers the granite edges completly, from the top to bottom of the edges but the skirt width should not exceed 2" in size.